The next Androscoggin Beekeepers meeting will be held: March 8th, at the vestry of the West Auburn Congregational Church, 811 West Auburn Rd, Auburn, ME 04210. Club business will be conducted from 6:30 PM to 7:00 PM followed by a discussion with visiting outdoor educator Grace Kenney. Grace will offer her presentation on “The Birds and the Bees“. Grace Kenney, originally from North Haven, Connecticut, first arrived in Lewiston-Auburn as a student at Bates College. There, she pursued a degree in Environmental Studies and a minor in Geology, greatly enjoying her schoolwork and appreciating all the chances it gave her to play—or learn, ahem…— in the great outdoors. Sad to leave Maine after graduating, she kept her work boots on as she tromped back to southern Connecticut and began working full time for a small-scale (albeit the state’s largest!) commercial beekeeper. What began as an internship the summer before her senior year offered the unique opportunity to dive head-on into the world of honeybees—lots of honeybees. With roughly four hundred hives to tend to amidst ever-changing seasons, it seems as though there is always more to learn in the life of a beekeeper. While no one should assume her days of beekeeping are past, Grace has also begun a new endeavor as an environmental educator for the Connecticut Audubon Society. Teaching outdoor, hands-on programs to school groups, scout troops, and other visitors to the center in Glastonbury, she is excited to play a more active role in fostering an understanding of and appreciation for the natural world right at people’s fingertips, right by their homes. This is a super-cool way of saying that Grace has found her dream job where she combines nature, science, storytelling, and compassion, and gets to keep her boots on, too. In her presentation humorously named “The Birds and the Bees,” she will take that famous saying a little more literally than usual. Discussing her transition from college life to working for a commercial beekeeping business and then the Connecticut Audubon Society all in just one year, Grace reflects on her experiences and the core values she has brought from one phase of life to another. ** Our meetings are the second Wednesday of each month from September to May, with hive openings during the warm months. We meet at 6:30 for a brief business meeting and informal sharing on what is happening in our hives, and then have a program at 7, which usually lasts an hour, including questions. We meet at the vestry building of the West Auburn Congregational Church, 811 West Auburn Rd, Auburn, ME 04210. For more information about the Androscoggin Beekeepers Club, please visit our website at http:// androscogginbeekeepers.org. Tips from State of Maine Entomologists on Eliminating Browntail Caterpillars. 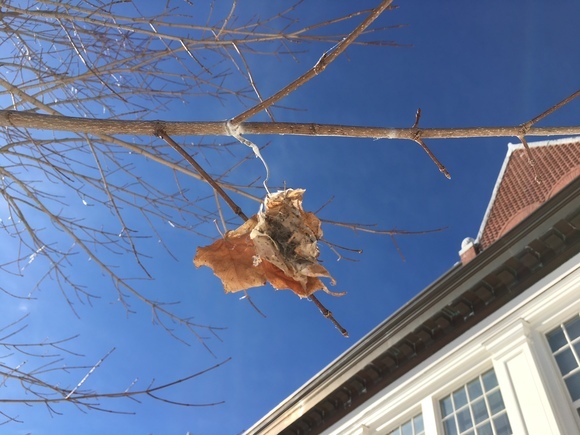 AUGUSTA- Entomologists from the Maine Department of Agriculture, Conservation and Forestry say now is the time to eradicate browntail caterpillars in trees that are accessible. Browntail caterpillars cause a rash like poison ivy and they are spreading across more and more of Maine. Contact with caterpillar hairs can cause severe reactions for some individuals. The caterpillars spend the winter webbed in silken-wrapped leaves on the tips of branches of oak and apple trees. NOW is the time to look for the bright white silk tying a few leaves to the TIPS of your apple, crab apple, plum and oak tree branches. If you see a web CLIP IT OUT and destroy the web by dropping it in a bucket of soapy water, do not just leave it on the ground. 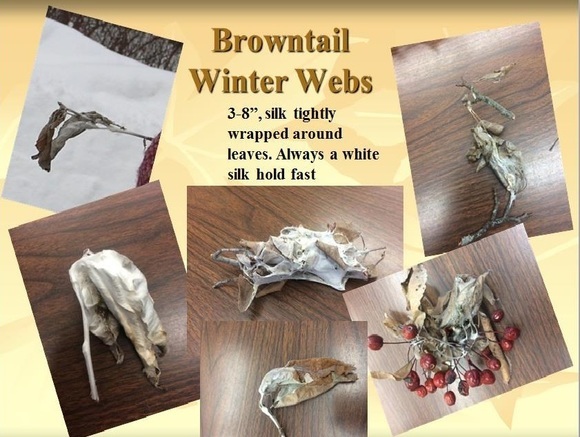 These caterpillar webs can be found regularly from the New Hampshire border to Waldoboro, and inland to Turner and Waterville. They are worst along the coast from Falmouth to Bristol. The moths have been seen all the way to Kingfield, Millinocket and Topsfield on the New Brunswick border. For More Information: Contact the Maine Forest Service (207) 287-2431 or your local University of Maine Cooperative Extension Office. Next Androscoggin Beekeepers meeting: March 8th, with visiting outdoor educator Grace Kenney. Grace will offer her presentation on “The Birds and the Bees“. Our meetings are the second Wednesday of each month from September to May, with hive openings during the warm months. We meet at 6:30 for a brief business meeting and informal sharing on what is happening in our hives, and then have a program at 7, which usually lasts an hour, including questions. We meet at the vestry building of the West Auburn Congregational Church, 811 West Auburn Rd, Auburn, ME 04210. Hope to see you there!